Maria 'Cabiria' Ceccarelli: [in Italian] It's beautiful. Come on. Q: Is 'The Nights of Cabiria' based on a book? Q: Why were people walking barefoot in the religious procession? Le Notti is a very rich,thematically, and diversified movie:the freshness and the concreteness,a strange inebriate detachment (in the "Alberto" the movie star episode),men's wickedness,the horrible baseness,the sordidness,the suavity,the gentleness and the bitterness,the irreverence towards the Christianity,also themes from previous (Il Bidone,La Strada) and even future (La Dolce vita,Toby Dammit,the easy-going eccentric Roman inebriate night life,Rome's night life) films.Fellini no longer believes in,or no longer practices the Shakespearian notes he used in Il Bidone,that kind of Shakespearean intensity.Anyway,like "Il Bidone","Le Notti" changes register in its last part,and offers that unsparing insight deeper than the reality itself.Transitional movie,"Le Notti" is at once a recapitulation of themes from previous works,and a preparation for his future essays (the 4 great movies from the '60s).The epic texture is still important.I don't think that Fellini ever bets on the "social document",etc.,and his ephemeral,or,at least,temporary association with some Neorealists in the '50s is generally misunderstood and made to mean something it never was.A thin-skinned prostitute,"Cabiria",meets a bashful accountant.Seen through Cabiria's experiences,her tribulations,the things she sees, tell more about her own mind,she is not,as such,the director's representative,though Fellini depicts reproachfully the malice of some of those met by Cabiria in her way.The world as presented in "Le Notti ..." is,at least partially,seen through the prostitute's eyes,hence the touch of grotesque and even some kind of a twisted naiveté,a la Sue.In this world seen by Cabiria,there are some landmarks of concrete humanity,e.g. the philanthropist met by the prostitute,or the Friar.It is always surprising,but also heartening, to see a man of great intelligence needing to give goodness and humanity a place in his work. (Kusturica,who refused any resemblance with Fellini and denied any influence,uses the same kind of endowing the sleazy worlds he explores with at least one firm landmark of goodness,so this world it is not left to its own degeneration and cowardice. )I see in this lapidary insert that never patronizes the sign of a distinguished deftness. (In "Il Bidone" such a character misses. 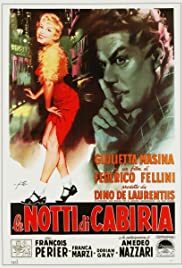 )Albeit mixed with irony and sarcasm (those of an exceptional mind ),Fellini's compassion is none the less authentic.His relative neutrality,his neatness in handing this humble epic stuff do not make him an indifferent witness. (As a youngster,Fellini planned to make a movie about a "little wildflower of grace", Serenella ;more interesting is to note that this "little wildflower of grace" was,for Fellini,one of "the two faces of the Church".Fellini had opinions,had ideas about real life,goodness,etc..Fellini even had a very keen and salubrious idea about the true task of Christianity for man,to "restore him to his divine greatness". )He was also known to admire humility, simplicity,and he knew to be politically incorrect in this. "Le Notti" may be Fellini funniest movie:it abounds in comical things,and this comic is always tasteful and intelligent.It also has a certain quality that can be simply described as gentlemanly.Also,let us note that in "Le Notti" Fellini avoided the cruelty's altitude reached already in "Il Bidone",but maintains a more comical and grotesque register.In "Le Notti ..." Fellini still has a narrative thread;he gives shape to various intuitions,feelings, perceptions,dreams,in an impressionistic and fancy but well-conceived and finely molded way.His enjoyment of the clownish aspects of the reality is a relish. Cabiria's world is explored with Fellini's appetite for the concrete.He connives with the prostitutes and the hussies,sends Cabiria in the medium of the rich,in that of the religious pilgrimages....There are some powerful vignettes,displaying Fellini's gusto and skills for seizing various facets of the social life.His mastership in depicting realist scenes that none the less have a bizarre and ambiguous twist is obvious in Cabiria's tribulations.With the air of making a purely reflexive and intransitive work,Fellini still expresses freely,with an Un-faked ingenuity, his thoughts about life,people,etc..While affecting to leave outside his feelings and opinions about everyday life and the common experience,Fellini none the less slipped his own thoughts and reactions,because he did have them and was not sank into some kind of impassibility,placidity and indifference.Fellini's ironic detachment,caustic sometimes,was,in his '50s movies,a good way to perceive the reality and to depict it without being patronizing or Thesist.The man was very refined and subtle and he refused to be encapsulated,enclosed,encompassed in an artistic formula;he believed in the richness and irreducible character of both life and art.This playful man wasn't a joker.Fellini passed a judgment on certain aspects of life,and resented the cruelty and the wickedness,without ever being didactic or moralist;but it must be said that,as director,he was both very intelligent and ironic,and ingenuous,natural,spontaneous;one,no less than the other.He was as impassible and as ingenuous as his very keen intelligence made him to be.Nobody was farther than Fellini from conforming himself to a theoretical model about how should man be and create. I want to praise "Cabiria"'s actors' genuineness,beginning with Mrs. Masina;this was her fifth movie with her husband.She was ever more than a "Fellini actress".Her ethereal and funny approach denotes a very mature understanding. (But it is true that Fellini wanted for his movies real actors, great actors,not puppets,he favored the creative skills of the actors.) François Périer's performance is simply gold;it has that sensitivity,delicacy,nuances and fineness that are compelling. Fellini agreed,once,that "all my films revolve around " the "love toward one's neighbor".Those who are used to receive this only in a conventional,didactic way,won't even recognize it in Fellini's works. Averty did the best homage to Fellini,considering him one of the three directors that never made a bad movie,and unable to make one.I subscribe.